How does complete payroll and Automatic Enrolment assessment work? To program a payroll software to execute both payroll and Auto Enrolment function simultaneously with one click is not a complicated task. It is just a business decision for a payroll software house. A software vendor may combine the two processes in one and charge the user only for one, or it can spilt the process in two and charge a user twice or more. 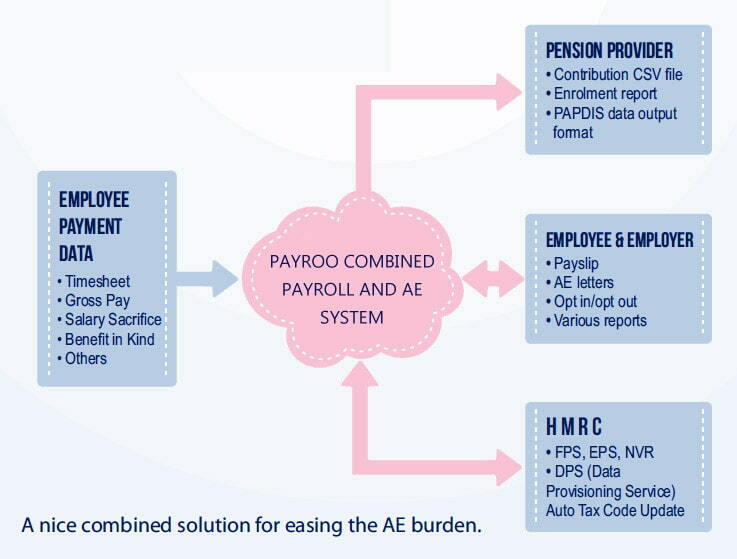 The reason why it’s achievable for software developers to combine payroll and Auto Enrolment into one process is based on the simple fact that the source data required for Auto Enrolment assessment and reporting always comes from the payroll system. The parameter that are needed for Auto Enrolment assessment and reporting consist of tax rates, employee earnings and DOB, which are always embedded in any payroll system. The staging date, postponement date, opt out date or opt in date may not exist in a payroll package but the data is not hard to capture by adding the related data fields on top of the existing payroll settings. What does Auto Enrolment Middleware do? Auto Enrolment middleware re-engineers the payroll engine to re-calculate the pension deductions, and potentially manages the entire process. The associated Auto Enrolment letters for the different categories of Auto Enrolment employees are generated through the reports based on the qualifying earnings in the payroll system. Payroo’s Internet Payroll would like to respond to popular market demand and provide a combined payroll package with Auto Enrolment process accordingly. Payroo’s payroll system facilitates you to set up single pension provider with a single pension scheme, or multiple pension providers with a multiple pension schemes. Whichever pension provider or scheme you choose, Payroo’s Web payroll package will support it. Payroo’s payroll provides you with extensive range of reports. In addition to the routine comprehensive reports, the system further provides all the key data in CSV and XML files ready for you to export. PAPDIS data output format is also available with the Payroo’s online payroll package for you to use for any pension provider who care to support this industrial standard.